This really beautiful Baltic amber heart pendant has a suprise in the center. 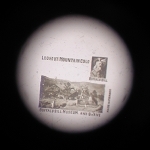 Peer into the stanhope peep hole lens and see a microscopic photo of the image of your choice. It is crystal clear and easy to see, even if you normally have poor eyesight you should see it clearly. 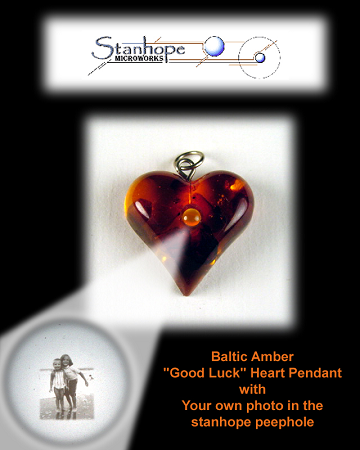 If you like stanhopes, you'll love the way the photo looks inside this nicely designed golden orange piece. Amber is popular among all age groups and can be worn with just about anything. This small amber heart measures slightly under 1" high and 1" wide. 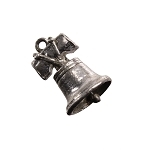 It has a sterling silver eyelet so that it may be easily put on a chain or necklace. Amber is known to have certain healing qualities and is said to bring happiness to those who carry and wear it. 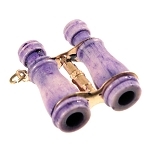 One of our best selling jewelry items. NOTE: Titles should contain a maximum of 24 characters. Be sure that your punctuation and capitalization are as you desire.